Since Laura Ashley took their first foray into bathroom design, their stunning collection has become increasingly popular. On display at Willbond, Nottingham’s exclusive stockist, these lovely bathrooms blend authentic traditional with true contemporary style. The Laura Ashley Bathroom portfolio features fabulous bathroom furniture in hand painted, muted tones of soft grey and off-white, complimented by stunning baths, bathroom basins, WCs, mirrors and coordinating taps. With its grand styling, you can see this stunning Claremont freestanding slipper bath on display at our Nottingham showroom. The acrylic is smooth to the touch and has great thermal properties to retain heat. 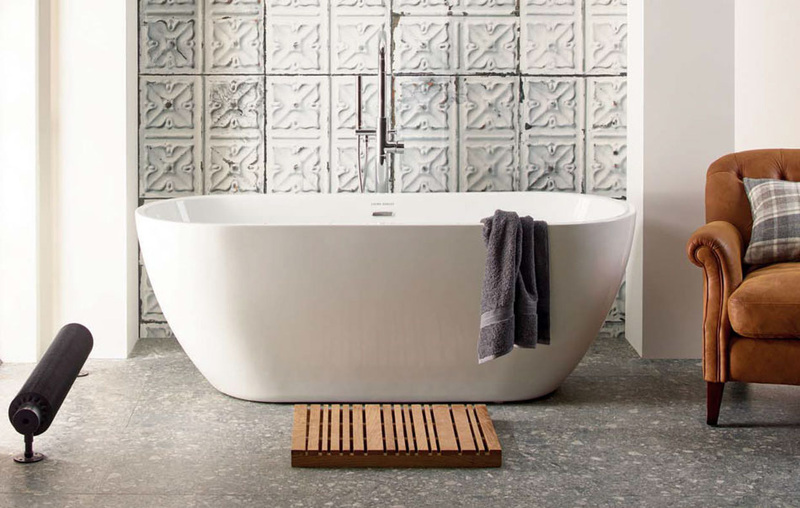 Use either freestanding or deck mounted bath taps, and your choice from white, black or chrome bath foot finishes to complete the look. The Marlborough collection is the ideal choice for your country bathroom haven, or team it with Bloomsbury sanitaryware for a classical and refined style – truly timeless. Classic freestanding furniture options with shaker styling; the Marlborough pieces are available in hand painted Cobblestone, Cotton White, or Charcoal finishes. Two distinctive basin units are offered; a 600mm full door unit option, a well thought-out 1000mm unit, a choice of marble or granite tops crowned with a ceramic vessel basin. Either will certainly keep your bathroom looking clutter-free. To spot a great piece of bathroom furniture, look at the details such as timeless styling, expert craftsmanship and the highest quality fittings – Langham has it all and more. Curved pilasters and subtle beading bring classical carpentry into your bathroom. Hand painted in either Cotton White, or Steel Grey the stunningly styled Langham adds a touch of sophistication to your period home. Paired with an elegant 600mm basin whose matching soft rounded edges and classically styled three-hole overflow deliver a truly understated accent. Laura Ashley's Opus double-ended freestanding bath has a clean design for the ultimate style statement and comes with a ten-year guarantee. The lustrous acrylic finish is smooth to the touch and has great thermal properties as it retains heat. Simply team with the Lucca freestanding bath shower mixer, fill your bath and relax. Laura Ashley's collection of fine furniture oozes quality and craftsmanship backed with a ten-year guarantee. The bathroom furniture incorporates hand-finished units with five piece doors & drawers, which include adjustable, soft close hinges. As you'd expect, all of Laura Ashley's bathroom furniture ranges have matching coordinates; a tallboy with oodles of storage also featuring a reversible door for left or right hand opening and adjustable shelves. The stunning illuminated mirror has the latest infrared, touch-free activation and a clever heated demister pad. Traditional wooden wall cabinets with mirrored doors are all designed to harmonise with your Laura Ashley bathroom furniture. For a stunning centrepiece, look no further than Laura Ashley's freestanding statement baths. Perfectly partnered by a must-have collection of stunning sanitaryware that spans classic through to contemporary styles. That's not all - Laura Ashley's premium tap collection features three ranges of matching taps, from the seriously contemporary open spout to the traditional crosshead style, coordinate perfectly with your dream bathroom's look. You'll see it's a breathtaking collection second to none - Laura Ashley on display at our Nottingham Showroom.